Tiles. We use them in bathrooms and we use them on floors. But have you ever used them as part of a piece of furniture? Nope, me neither. But when you think about it, it's perfect! They're so hardwearing, they can make a real feature or statement in a room and many are even waterproof too. They're the perfect material for building a table base with! You'll never have to worry about kids kicking the table again and those mud marks will wipe straight off. You'll have a real bespoke and unique piece of furniture that's not quite like anything in a catalogue, and what's even better - the investment on tiles can be transferred with you when you move! 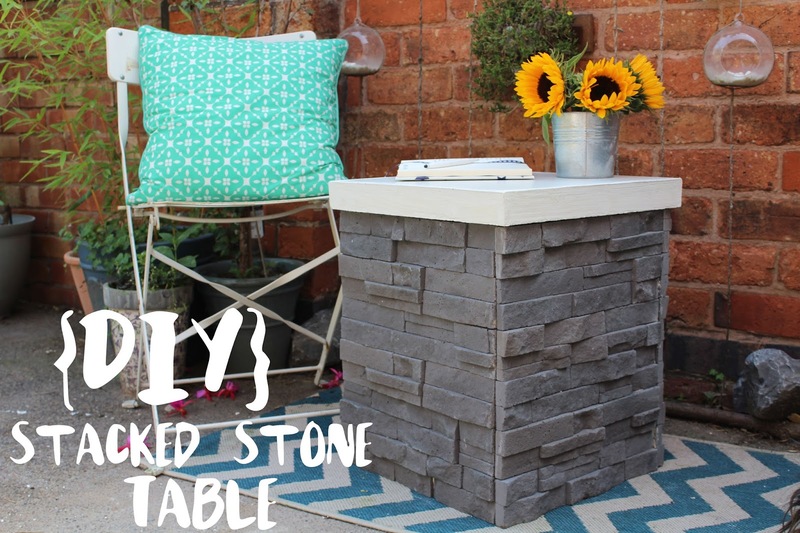 I've been wanting to make a feature table for some time now - we have a conservatory we're currently renovating that's dying for some furniture and these Stacked Stone tiles from UK Feature Walls just yelled 'TABLE BASE' at me. So, I had a go, LOVE it, and thought I'd share with you how it's made. The best part about this table is that it's completely suitable for either indoor or outdoor use, so if you're after a new garden table, this might be exactly what you need and using various materials around the home makes it super affordable too. In order to use tiles as a base for a table, they need to have a suitable surface for tiling onto. This needs to be quite strong to hold the weight of the tiles too. I'll be using hardiebacker for this job (can be purchased from most B&Qs), which we had leftover from previous DIYs. This stuff tends to be used for creating shower enclosure walls and then tiling onto. Which means it's completely waterproof - perfect for the garden, super strong, and it doesn't break the bank either. I cut (or rather, I asked Grant to cut) the hardiebacker into four exact rectangles using a jigsaw. The sizes of these will determine the overall size of the table; mine are roughly 45cmx30cm. 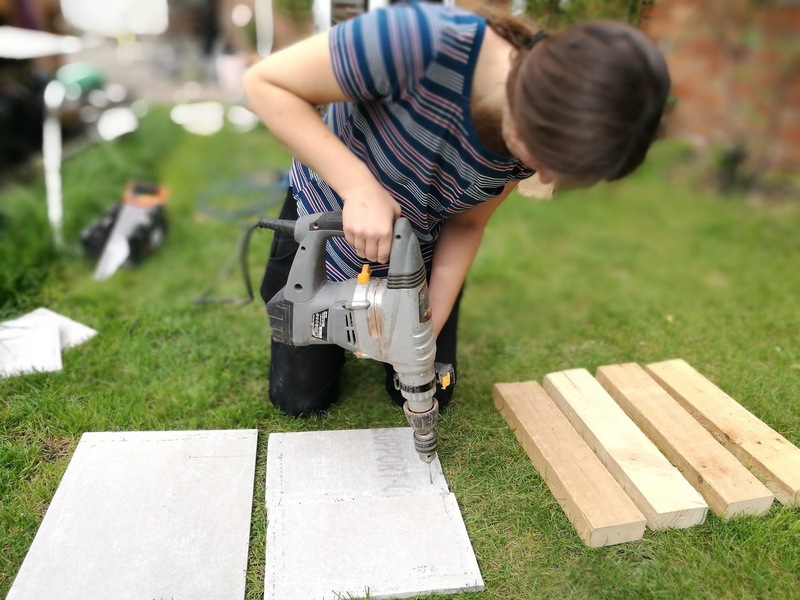 Hardiebacker board is pretty tough stuff, so I do recommend a power saw rather than a manual one for this job, or you might be there for some time with rather blunt blades by the end. I then cut four lengths of wood to the same height as the hardiebacker and height I wanted the table to be (45cm). If you intend on keeping the table outdoors, make sure to use treated timber that's suitable for external use as the feet will get wet on the floor. The timber also needs to be quite chunky and strong to hold the weight of the tiles and the concrete top. CLS structral timber is perfect for this job and only costs a few pounds. I'm using similar timber I'd saved from a skip. Step 3 - Tile Away! Now for the fun part - tiling! The tiles I'm using are from UK Feature Walls and are their Stacked Stone tiles in grey. I love the natural look to these tiles, when they're laid together they look seamless rather than individual tiles. There's various lengths and formations of the tiles in each pack and they can also be fitted upside down, so the pattern really doesn't repeat at all, particularly over a small area like this. I think they're the perfect tiles for this DIY. I used a wet tile saw to cut them and they were literally the easiest tiles I've ever had to cut. It was like slicing through butter. 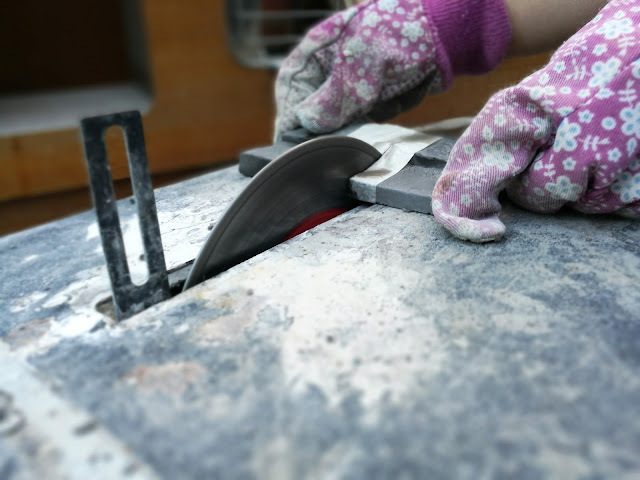 My top tip for using a wet tile saw is to place masking tape over the area you want to cut - it stops your pencil line dissolving through the water and it leaves a smoother cut. I laid tiles on one side at a time, letting it dry before rolling the table over. Don't forget - if you intend on using the table outside, you'll need a tile adhesive that's suitable for outdoor use. This is one I had lying around and happened to be suitable for outdoors anyway. I've really wanted to have a go at making a concrete top and I felt this project was the perfect opportunity. Generally speaking, melamine is the best material to make a mould out of since it's completely smooth. We're on a budget here and using bits around the house (if you couldn't already tell) so we'll be using wood with an old kitchen worktop. The wood will leave a rougher finish around the edge of the table, but the kitchen worktop will be just as smooth as melamine. This will be the top of the table. I cut the wood to the size I wanted and then screwed it directly onto the worktop, making sure everything was completely square with an angle finder. I then used some sealant around the edges between the wood and worktop and also between the corners of the wood. This will stop the cement mix seeping under the wood. I always apply sealant with a gun and then use my finger dipped in a fairy liquid and water mix to smooth it out. Once that's all dried, you can then pour cement. I'm using a white cement, which is actually called Snowcrete from Wickes. I'd never used it before, but seen it on the shelf enough times to know I needed to try it at least the once! 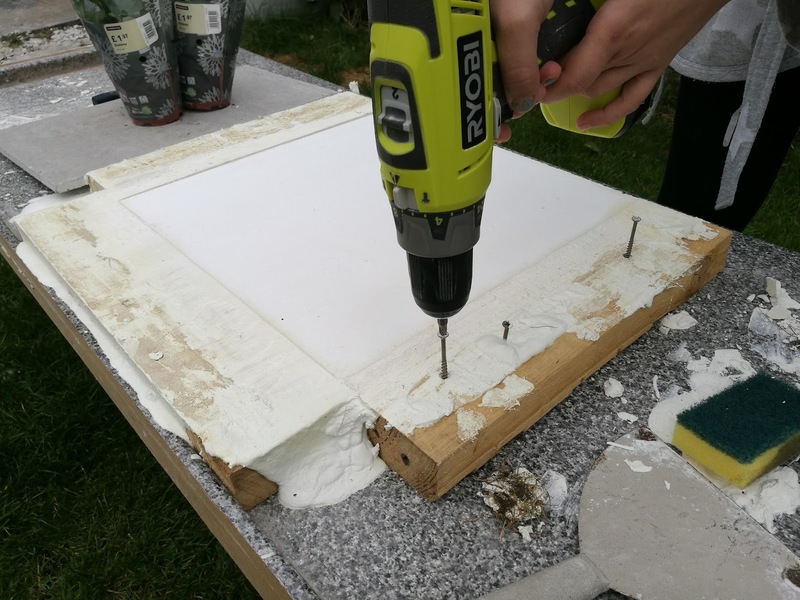 You can also use regular cement with dye if you're after another specific colour, or already have some leftover cement already lying around. 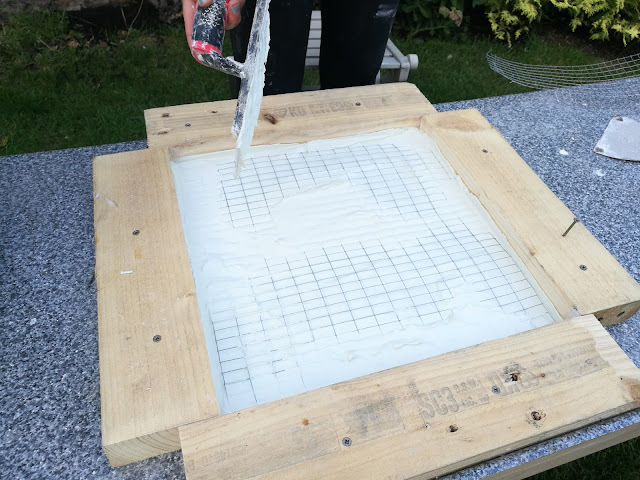 I poured the cement into the mould around halfway up before inserting some wire mesh. I wasn't entirely sure how essential this was, bearing in mind it's quite a small table and this wire mesh isn't exactly going to re-inforce it much at all. But, I added it non-the-less. Like I say, this is the first time I've made a concrete top - so it's all learning curves! If you're making a large table, you will definitely need some strong reinforcement in the middle, I recommend rods. One thing I hadn't done was ensure the mould was completely level before pouring the cement. Yep - rookie error! The worktop was actually balanced on two chairs on our lawn so it was obviously less than level and caused the cement to slope accordingly in the mould. 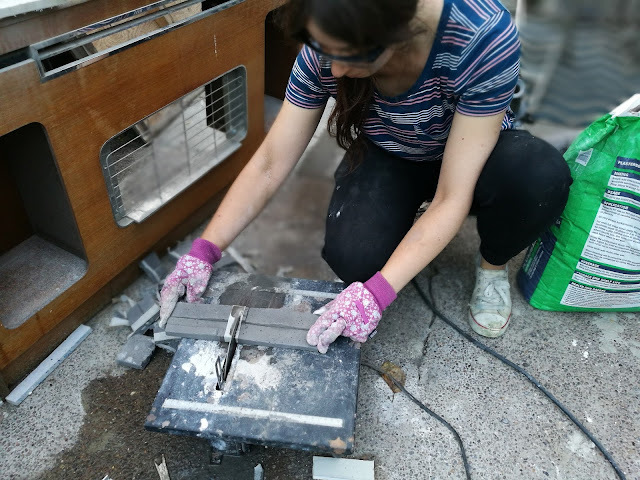 I then had to juggle trying to level the worktop which was already covered in very heavy cement, so do make sure to do this one first! I found a length of wood was the best tool for levelling out the cement. By wiggling back and forth along the mould, it evens everything out nicely. It's also important to remove any bubbles in the cement as well as these are weak points and too many of them is bad. This is simply done by hitting the side of the mould which causes the bubbles to rise to the surface. You can then smooth back over with the levelling wood. After a 48 hour wait, it can now be lifted from it's mould. 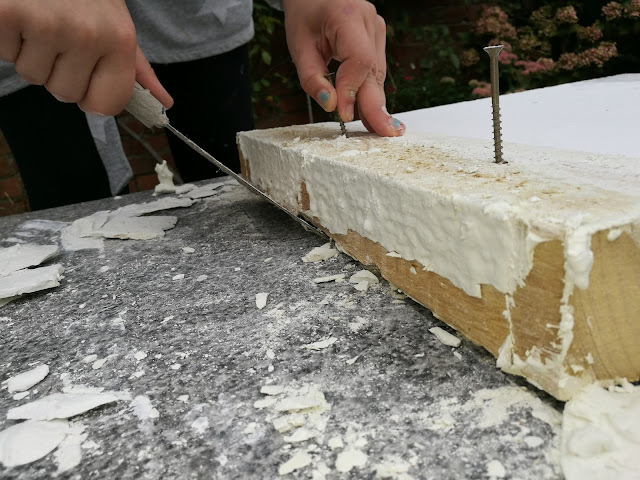 This needs to be done very gently as it will be stuck to the sides and base and you don't want to pull off any of the concrete along with removing the wood. I unscrewed the lengths of wood and used a scraper for leverage whilst gently wiggling the timber away. I must say, I was deeply relieved when it came out in one whole piece! 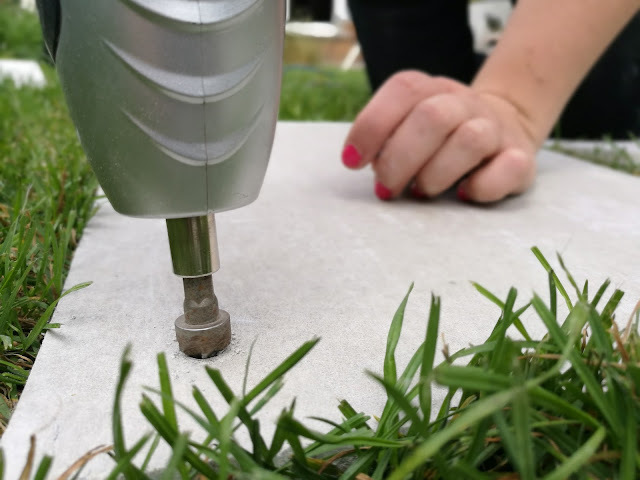 Since the concrete top is pretty heavy, there's no need to physically attach it to the base, it really isn't going to be knocked off with much ease! Not having it attached also means we can store things inside it too (great for garden cushions during winter!) and makes it a little more practical. And that's it - you can now sit down with a book and glass of wine and enjoy your new table, indoors or outdoors. I absolutely love it, I think it's really eye catching and is a real piece of interest in the garden. In the future we'll be relocating it into the conservatory, but since that's full of DIY tools and materials, for now I'm really enjoying how it looks in the garden. The stacked stone tiles almost make it look like it's been made by one piece rather than individual tiles and the contrasting smooth white top gives it a really modern feel. I love the two different textures between the concrete and tiles and I'm thrilled to bits with it! I still have some tiles left, so I'll definitely be creating more DIYs with them soon. I'd love to know what you think - would you recreate this or something similar in your home or garden? Have you used tiles elsewhere in your home? For a tutorial on the hanging feature wall behind, click here. *Tiles were kindly provided for the purpose of this DIY Tutorial. All words, thoughts & reviews are my own :) Thanks for supporting the brands who support this blog. Valuable site, where did u come up with the information in this posting about this concrete patio contractors san diego topic. I am pleased I discovered it though, ill be checking back soon to find out what new content pieces u have.